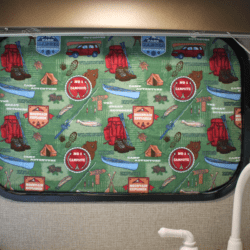 Camping crafts are so fun for so many reasons – to break up winter, celebrate with at a camp themed party or preschool week, or even while you’re camping to have a fun memory! I love them because not only are they fun for imaginary play, but alot of times camping crafts can be used with items found outdoors too! 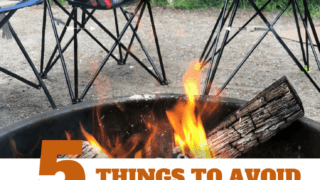 Anyways, here is a big list of all the best camping crafts I have, as well as the ones I’ve found online! 5. S’mores cups to go! 8. Sew your own cute campfire set! 9. A large pretend campfire for parties or school! 10. “Campfire Pokey” song and flannel board! 29. Super mini pom pom lantern! 32. Make some “Sensory Soup” with items from around camp! 33. Make a campsite sign! 34. Use playdoh and nature to create something awesome! 36. Crate a special hiking stick with your kids! 37. Make some rock pets! 38. Create leaf people with leaves from around camp! 39. Speaking of leaves… make leaf rubbings! 43. Build a twig boat! 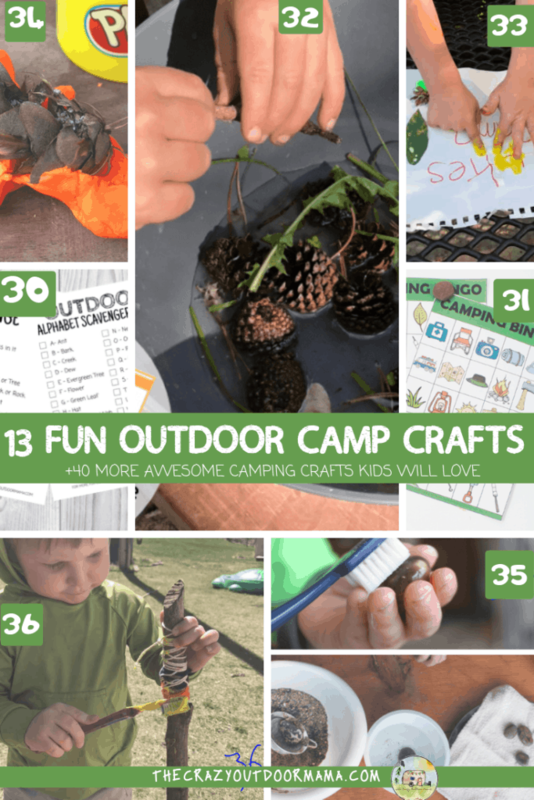 Do you have any awesome kids camping crafts to add? 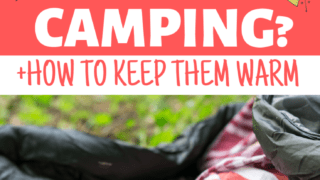 Pin this if you loved it, and KEEP SCROLLING for more camping fun! 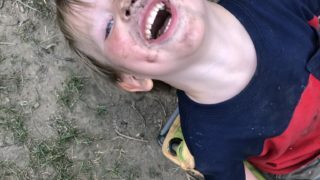 Possibly every kids favorite part of camping (unless they are a fire bug like my preschooler! ), s’mores are a traditional camping must! 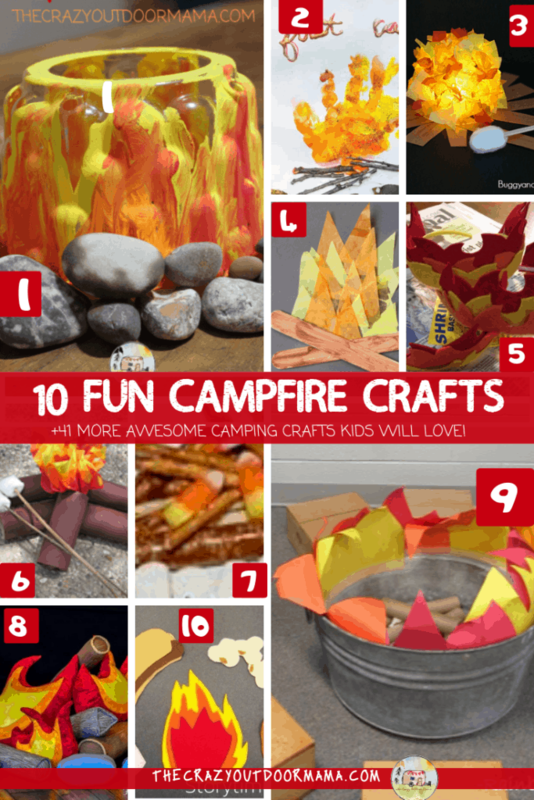 Here are some awesome s’more crafts to do with your child! This fun s’more necklace (as well as other camping necklaces!) is easy to make with some clay and paint! 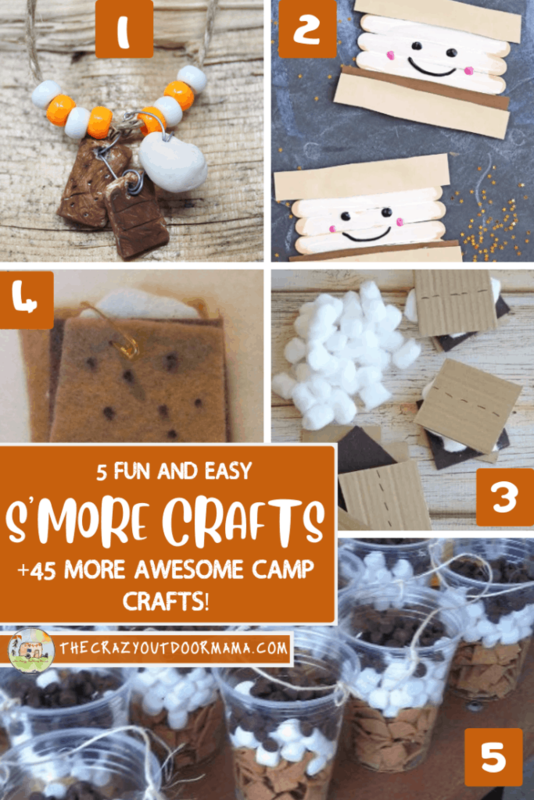 Kids will love making their very own s’more to remember that awesome summer camp! Glued to my Crafts is AMAZING, and her cute popsicle s’more craft doesn’t disappoint! See it Here! The best play for kids is imaginary play, and get that in with this cute DIY s’more playset! It’s simple to make, and the kids can play with it forever! It’s simple, but fun! This s’more is made from just felt and a cotton ball, but it’s super cute and small (so perfect to keep as memorabilia!) See it here! This edible s’more activity will be a hit at your next camp themed party! If you want to skip the actual s’more cooking, but still get to have fun with the ingredients, this s’more cup is for you! Yet another must for camping, campfires are so fun to recreate! Though they might not be quite as warm, these campfire crafts are still pretty magical! Don’t throw out that next plastic container – instead, reuse it and make an awesome glowing campfire craft! It’s easy to paint, and it feels good getting a second use out of something! What better way to remember that first camp trip, or even a fun camp themed party than with a cute campfire hand print?? It comes with a cute printable template so that you can frame it when you get home! I love this campfire if you’re trying to avoid paint use (see it here!) and it helps kids with their fine motor skills! Also… it’s real looking and cute! If you don’t want to have to collect any plastic, then let the kids tear up some tissue paper and turn it into a campfire! Easy, fun, and mess free! This is perfect for camping games with kids, IE who can get campfire stuff together fastest, makes the best s’more etc… what kid wouldn’t love a flame crown?? Some paint can do magic when it comes to crafting, and in this case turning something boring into something awesome – a campfire! See it here! 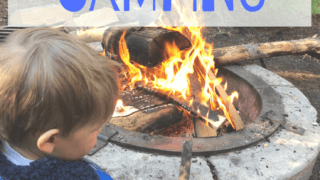 It’s so so important to learn about campfire safety, and since kids learn best through play, why not add a little more inspiration with yummy treats to really get them excited to learn about campfire safety! 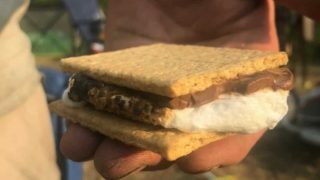 This little campfire project uses food to understand safety… and it’s never looked so delicious! 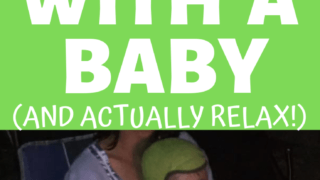 For the REALLY crafty moms, here is an adorable DIY campfire sewing tutorial! It looks so freaking cute, that it might actually inspire me to get out my sewing machine.. I know my kids would love it! 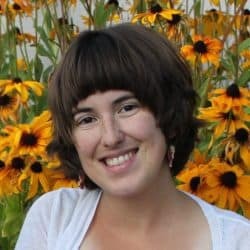 I had just learned about flannel boards a couple weeks ago, but I want to do the campfire pokey NOW because it’s cute and it encourages movement through song! The pieces are easy to cut out, and the song is fun to sing! Tents have always created get aways for kids and adults alike! 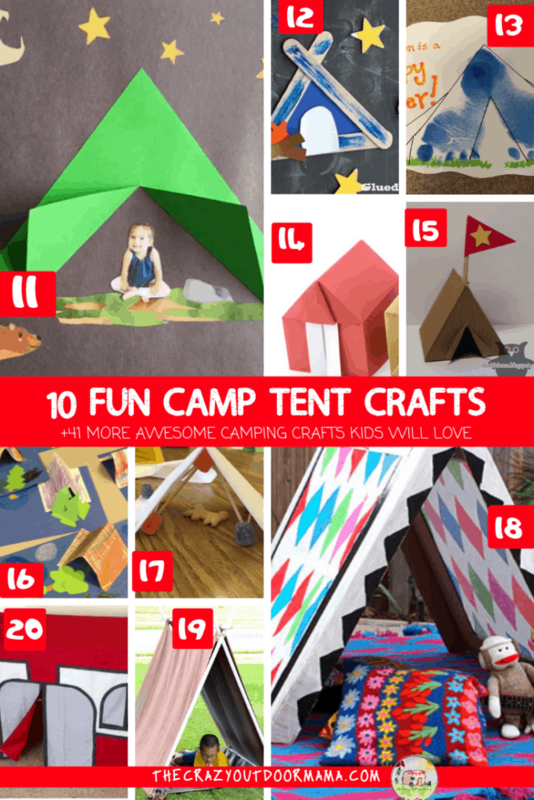 Check out these tent crafts that are almost as fun as camping! This is simple (you only need some paper and glue!) but I love that it can feature your child! Check it out here! Popsicle sticks are so fun to use, especially when it’s something fun to create with your preschooler like a tent! This tent popsicle craft is another easy but cute way to celebrate a camping theme! 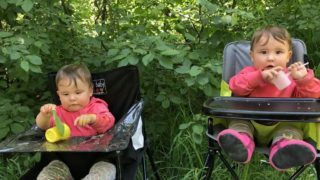 Do you love camping, and are eager for your baby to love it just as much? Well why not start with this cute tent footprint craft to remember how small their feet were when you took your first camp trip! This thing looks real, and I honestly would make it just for myself as decor I think! Check out this origami camp tent – it even includes a video for those like me who struggle with making this kind of stuff! This tent is similar to the origami one, except it actually has a printable tent template that might make it easier to use! It can hold some goodies inside too, so it might be perfect for your camping themed birthday party! 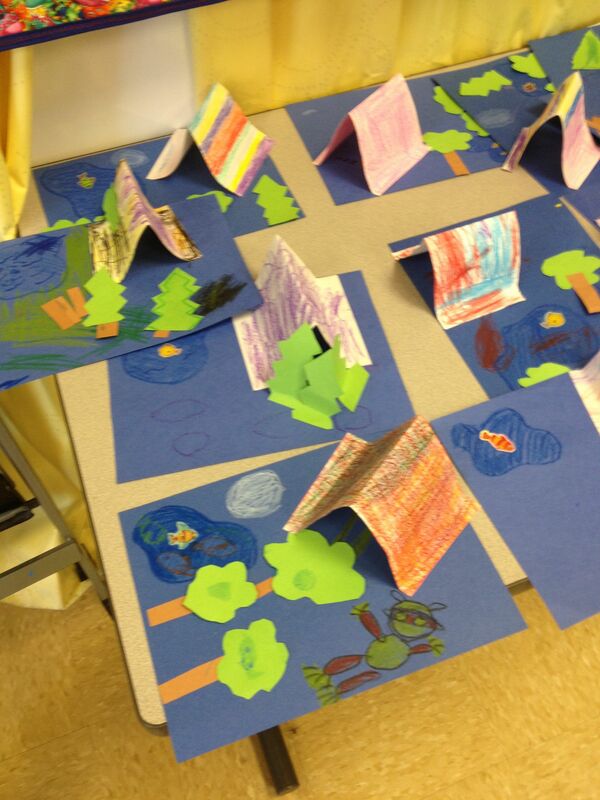 I love how this tent craft has room to really imagine and draw a whole tent camping scene! 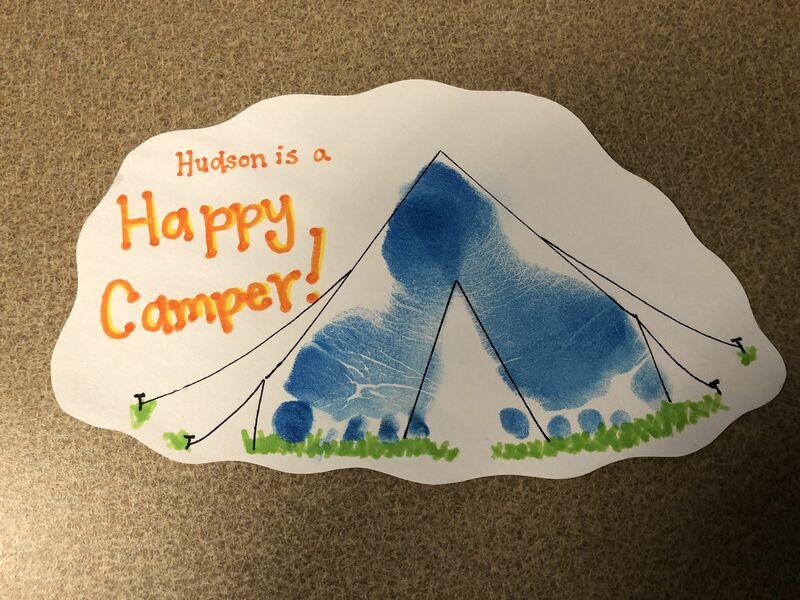 The tent is easy enough to make, and kids can add on what they want to the rest of the paper! Now we’re going to move onto tents that have room for kids to play in! This cardboard tent is great for using up those massive, awkward cardboard boxes we somehow get…. and it’s even funner because that allows the kids to decorate it themselves! While it could be used indoors, this simple design is really perfect for outdoors on hot sunny days! I love that it’s a no sew tent because sometimes I’m sort of intimidated by sewing tutorials, so this make it way more doable! So I know this isn’t TECHNICALLY a typical camping tent, but there are quite a few that are this shape! Besides, if you have more than one kids to entertain with a tent, you’ll need the extra space this playhouse tablecloth tent offers! Even though we tend to use plastic lanterns now a days (or let’s get real.. phone flashlights!) 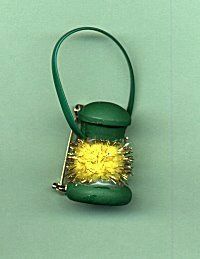 there is something magical about an old school camping lantern! 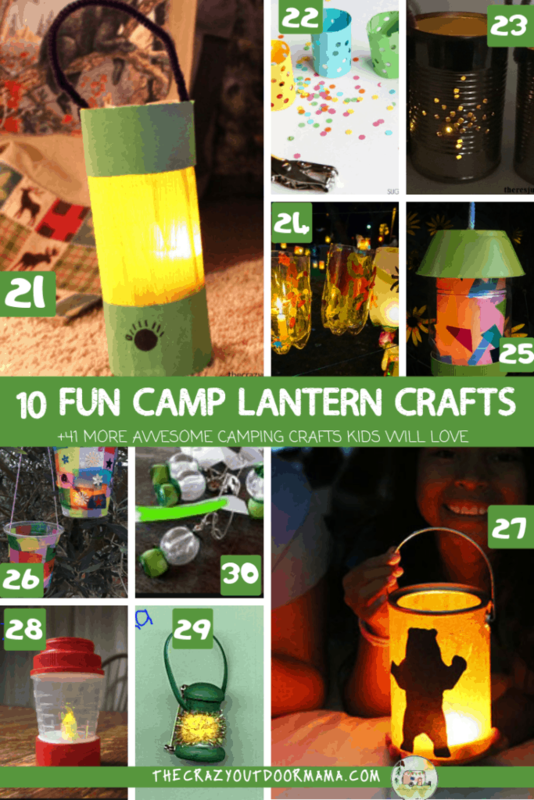 Check out some of the lantern crafts that the kids will love! This “coleman” style camping lantern craft recycles a plastic bottle and uses some construction paper to make this cute lantern the kids can carry! 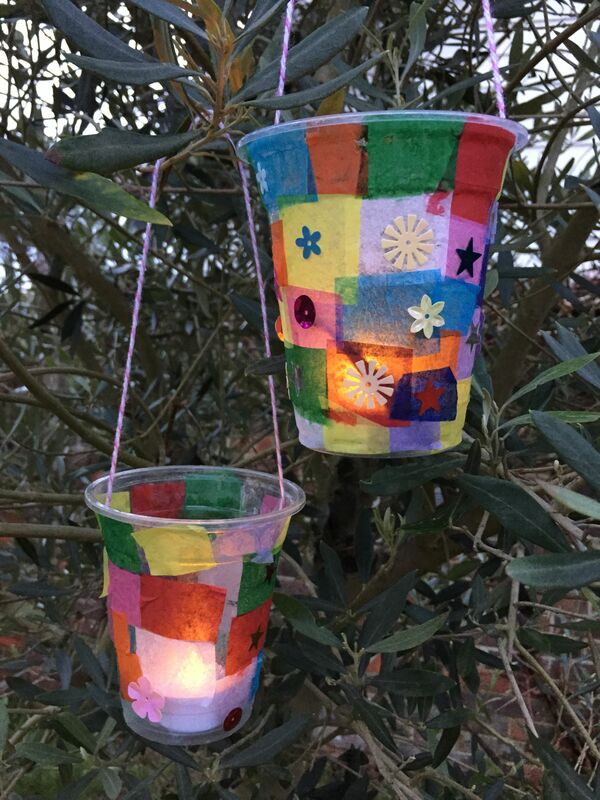 This is definitely the best bet for toddlers who want to make a lantern! The OT toolbox has this super simple but adorable craft that preschoolers could actually do all by themselves! I love how perfect his lantern is for parties and for actual use at a campsite! Since it’s tin, it can hold up to some rough play and repeated use! See it here! This mom was inspired by the Boston Lantern Parade, and made some of her own! I love this for bigger groups to string around the campsite or for getting a fun campy theme in the classroom! Peanut butter jars are the perfect shape to make a lantern, especially with the lid color and texture of it! This one even uses pretty tissue paper to really make it fun! These are easy camping lanterns to make for even preschoolers! Just a plastic cup, tissue paper, and a handle will be fun to decorate! See it here! This is adoorrable, and pretty easy to do! Let the kids pick their favorite animal to really personalize their lantern! Speaking of dolls, this one is even smaller than the last! It actually uses a pom pom as the “lit” lantern portion! This doesn’t have instructions, but it seems to use a button, the pom pom, and perhaps another button on top! 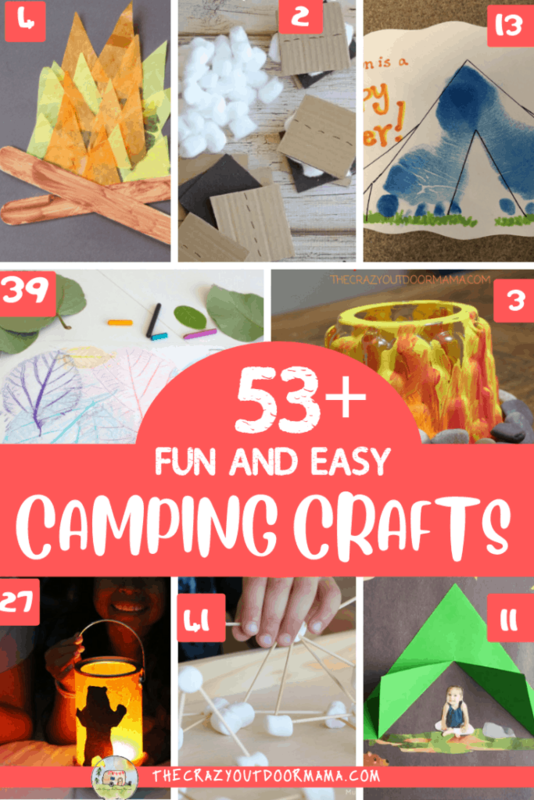 Now that we’ve gone over all the camp inspired crafts for kids, lets take a look at some awesome crafts you can do while actually camping! 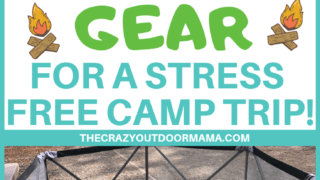 Since I have preschooler and under kids, alot of these activities will be for the younger crowed, however it’s pretty surprising how much big kids still enjoy camp activities! Alot of these are nature inspired, or can be done with some printables that you can prepare before hand. 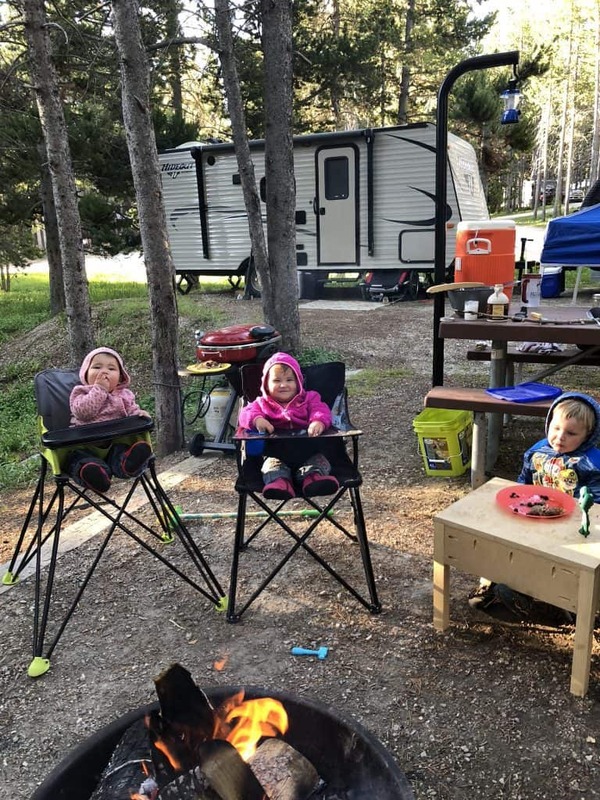 It really is the best way to keep the kids busy at the campground so that you can relax! 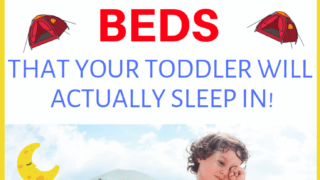 I know it’s how I keep my toddler busy! This has to be one of the easiest things to keep a kid busy while camping – print out one of these scavenger hunts (senses, experiences, alphabet etc) and let them try and find them all! 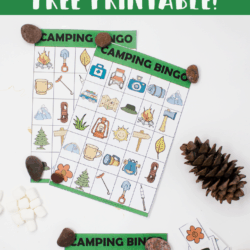 These camping BINGO cards are handy to have because they can either be used as normal, or turned into a scavenger hunt as well since these are all items that can be found at a campsite! It’s no secret that kids love playing in water, and with a fun “recipe” factor, sensory camp soup becomes a hit! There are 4 printable recipe cards that can encourage your little camp cook to create! Whoever said playdoh is just for fun at home?? It is actually a great medium for building houses, animals and fun murals! Bring the playdoh to camp for some fun creations! Going along with the same theme above, kids can keep busy for hours with just the fascination of cleaning off rocks! 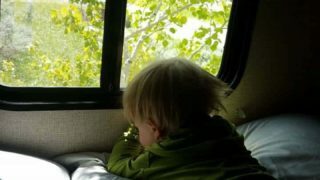 I like giving mine some extra stuff like a toothbrush and towel, but it really is a boredom buster for toddlers camping! If you plan on doing any exploring around camp, kids will love the opportunity to really customize their own walking stick! Paint, string, and whatever else they can use will also be a fun reminder at home of their great camp trip! Rocks were actually sold in “rock pet sets” in stores for a reason… putting some paint and googly eyes is really fun! Bring it back to the basics with this fun rock pets like these while at camp! There are so many kinds of leaves, so it’s really fun to take advantage of all those shapes and textures and make leaf people! For younger kids, make the outline of a person and ask them to fill it in with leaves! With so many textures, leaves can really make some pretty art when you color over them like this! The beauty of nature is amazing! 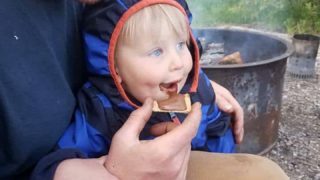 Marshmallows are almost always the highlight of any camp trip with kids, so why not use them for something more than eating like this! 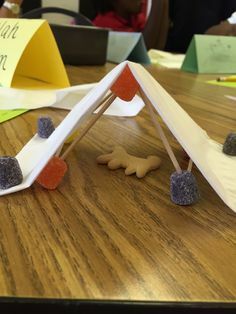 Continuing with marshmallow activities for camp, check out this fun idea to build with them! Turns out they are pretty sturdy, as well as yummy! This one will probably be the biggest hit with the kids yet… and it’s actually really easy to make! Set up some cups and try to shot them ( or each other, let’s be real!) with these marshmallow shooters! 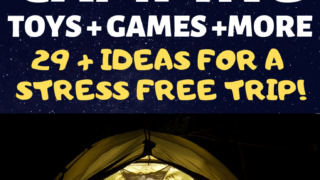 This list is seriously some of the best camping crafts of the internet – if you want to add yours, email me! 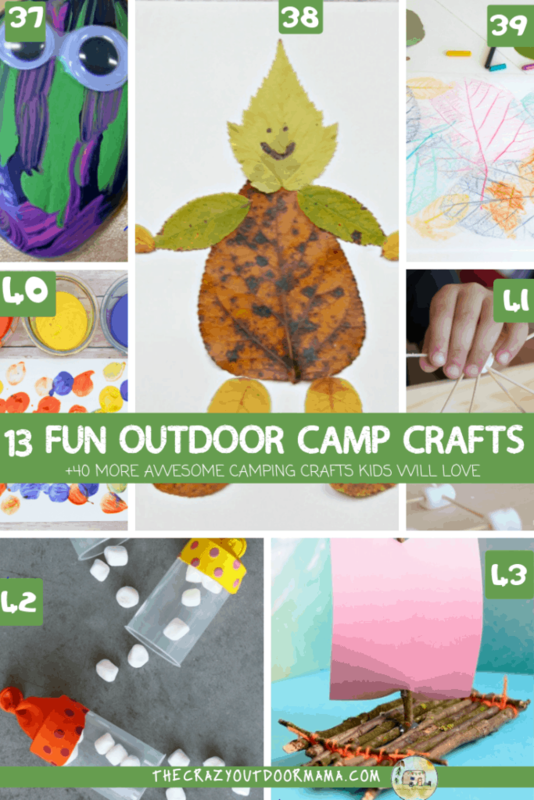 Kids love to craft, and even better, it really keeps them busy while camping! I hope you have gotten some inspiration! Somehow all 3 of my little ones in the same picture – my preschooler loved the camp crafts last season, and I’m pretty certain my now toddler twins will love them just as much this year! 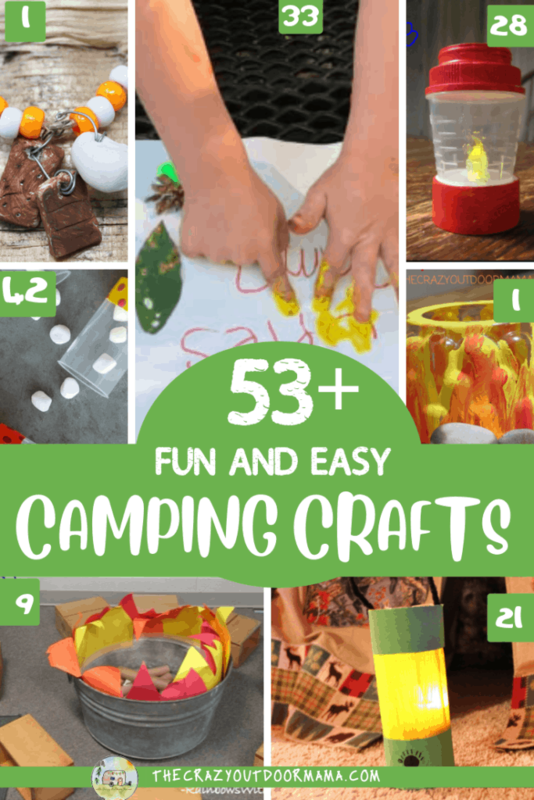 Crafts are just one part of the camping experience – scroll down below to see more camp how tos and activties!